India is a vegetarian’s heaven. Besides all the fresh fruits and veggies that are available in the markets, at roadside stands, and in neighborhood carts, the idea of vegetarianism permeates the culture. Religiously, it makes sense. Since India welcomes all sorts of different faiths, including those that won’t eat beef (Hinduism), those that won’t eat pork (Islam and Judaism), those that don’t believe in killing any creatures at all (Jainism), and those that don’t prohibit meat but still kinda sorta recommend against eating dead animals (Buddhism), the easiest way to avoid any misunderstandings is to stick to a vegetarian path. 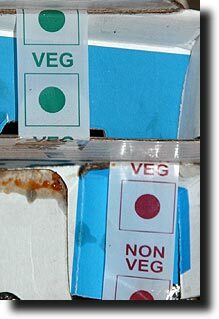 As such, all food that is packaged in any way is marked as either being ‘vegetarian’ or ‘non vegetarian’ with little green or red dots. Menus in restaurants (if the place isn’t billed as “Pure Veg” to begin with) always differentiate between vegetarian and non-vegetarian dishes. Even McDonald’s has a completely separate Veg menu (including such favorites as the McVeggie, McAloo Tikka, Paneer Salsa Wrap, and Veg McCurry Pan). Of course, this also means that meat dishes can be few and far between – as well as expensive. We bought 3 pork chops the other day (frozen, not at a restaurant) that cost 600 rupees: fifteen dollars!!! We have since found out that there are alternate places for meat shopping, but still! Our mainstay has become the ole chicken breast, but we’ll splurge every so often for some mutton (which is sometimes lamb and sometimes goat) and beef (which is really water buffalo). I try to talk the rest of the family into seafood as well, but there are few takers in that regard. One of the craziest things is that the plain pepperoni pizza – nothing fancy at all – is usually the most expensive item on the menu at pizza places (Domino’s and Pizza Hut included, in addition to the home-grown stores). Oh, and as far as the non-veg McDonald’s menu? Still no beef there, no matter what you’re willing to pay: you’ll have to settle for chicken, as in the Chicken Maharaja Mac!! This entry was written by Dave and posted on May 26, 2008 at 9:14 pm and filed under Life in India. Bookmark the permalink. Follow any comments here with the RSS feed for this post. Post a comment(Latest is displayed first) or leave a trackback: Trackback URL. Sounds very delicious – and very healthy. No wonder there isn’t a problem with having children! !